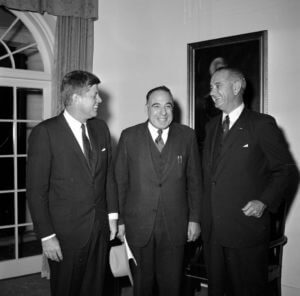 President John F. Kennedy meets with Representative Henry B. González (center) and Vice President Lyndon B. Johnson (right) on Nov. 8, 1961, in the White House Cabinet Room, Washington, D.C. The St. Mary’s University School of Law will honor the culmination of the centennial year of Henry B. González’s birth with a Gran Final celebration on May 3. The Honorable Henry Cisneros, former U.S. Secretary of Housing and Urban Development and mayor of San Antonio, will be the master of ceremonies. The public is invited to attend the event, Wednesday, May 3, from 5 to 7:30 p.m. in the St. Mary’s University Center, Conference Room A. Born during the Mexican Revolution to parents who fled its violence, González (LL.B. ’43, LL.D. ’65) became the first Hispanic Texas state senator, then the first Hispanic to represent Texas in the U.S. House of Representatives. Throughout his career, he championed social justice in the tradition of his alma mater, the St. Mary’s University School of Law – a legacy that has been continued by his family members. The Gran Final will include a preview of a documentary on his life and legacy with interviews of many well-known local and national politicians, such as U.S. Senator Jack Reed of Rhode Island. The event will also include the first public viewing of the declassified FBI file of Henry B. González. The FBI file includes revelations regarding the five death threats he received in the 1970s and reforms he proposed to FBI officials in the wake of a Civil Rights-era church bombing. Also on public display for the first time is the John F. Kennedy Profile in Courage Award given to González in 1994 and footage of the award ceremony honoring his efforts investigating the savings and loan crisis and sparking reform while he was Chairman of the House Banking Committee. González receives an honorary LL.D. 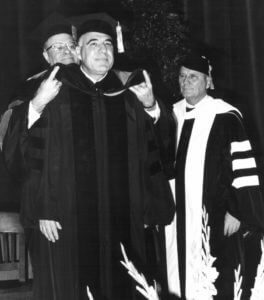 at the 1965 St. Mary’s University Commencement. Placing the hood is the Very Rev. Louis J. Blume, S.M., President of St. Mary’s from 1947 to 1954 and from 1963 to 1973. At his right is the Vice President-Dean of Faculties, Joseph Schmitz, S.M. The Gran Final is a collaboration involving the School of Law, St. Mary’s Professor of History Teresa Van Hoy and her Public History students, and the González family. “The life and lifework of Henry B. González offers us all a chance to rediscover a bygone ethic of service, integrity and unity that bridges racial and political divides,” she said. The González family has shared their private collection of memorabilia and taped interviews for the project. Henry González III will also offer a tribute to his grandmother, Bertha González, during the event. Sheppard said the School of Law is “proud to have Henry B. as one of our distinguished alumni” and thanks the González family for their support over the years. After the formal ceremony ends at 7 p.m., the School of Law invites guests to stay for a re-enactment of the annual Cinco de Mayo/birthday fiestas that Henry B. hosted in Washington, D.C.
For more information about the event, please visit the Gran Final of the Henry B. Gonzalez Centennial webpage.